Portions of the crumbling rear wall behind the Great Wall restaurant, 521 Main St., were removed late Tuesday, May 30, as continued erosion caused major safety concerns. Beginning late Tuesday night and into the early morning hours of Wednesday, the rear wall of 521 Main Street — home of the Great Wall Chinese restaurant — was demolished piece by piece because of significant structural damage. The demo work has left the first two floors of the building exposed and the building’s fire escape has been almost entirely removed. In just a matter of days — since the Sun first reported on Sunday, May 27 — the wall began to buckle and large sections of brick fell from the building’s facade into the alleyway of Allen Court at the rear of the building. According to a source who works in a nearby building, on Tuesday, May 30, city officials deemed the structure at 521 Main St. unsafe and evacuated staff at the neighboring MetroPCS at 517 Main St. and residents living in the apartments above it. 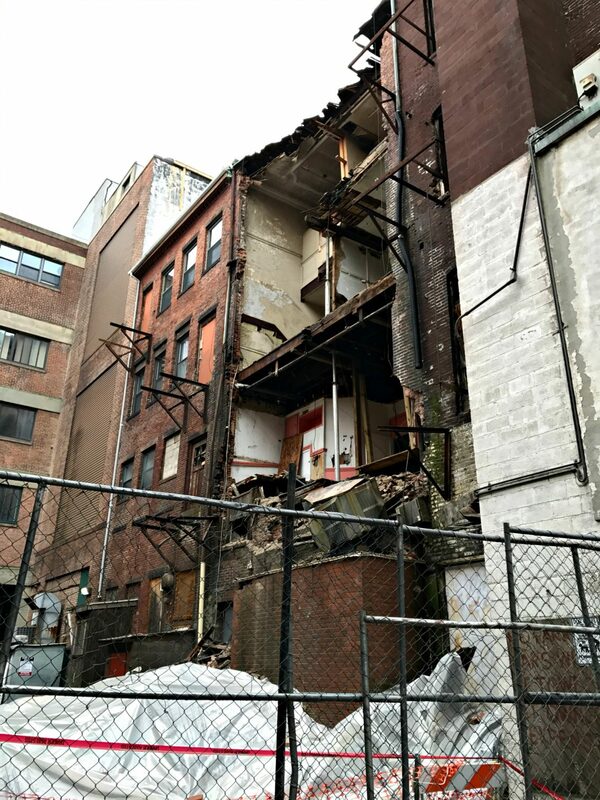 The same source told the Sun that F&D Truck Co., Inc. — a demolition firm in Millbury — was called in by the city of Worcester in case the building needed to come down on Tuesday. A hydraulic lift and excavator tractor sit idle in Allen Court following demolition work behind 521 Main St.
On Tuesday afternoon, Worcester Police barricaded both ends of Allen Court — at Franklin and Federal streets — the Department of Public Works roped off around the area where bricks had fallen, and National Grid turned off power to the building. City Manager Edward M. Augustus Jr., Building Commissioner John R. Kelly, and Traynor visited the building Tuesday afternoon to inspect the damage. 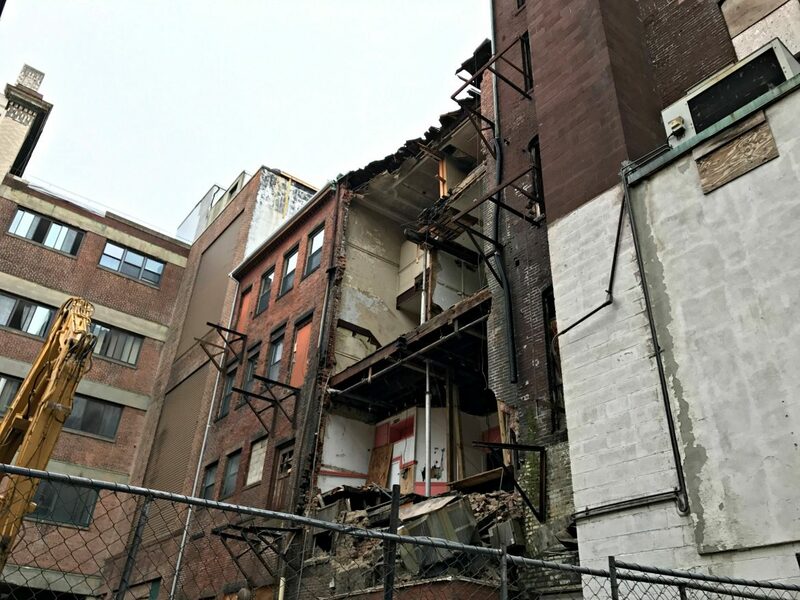 Traynor said in an interview Tuesday the section of the damaged rear wall was to be removed and the wall itself will be reevaluated to be sure the building is still structurally sound. 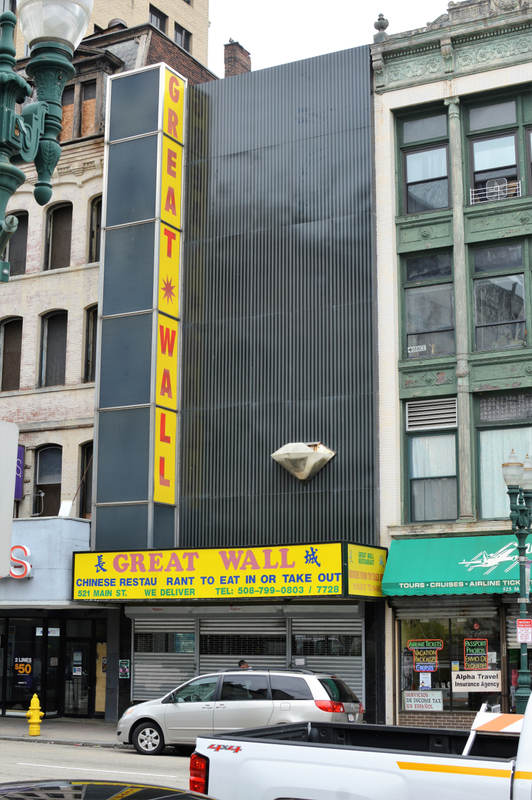 A public hearing remains scheduled for tomorrow [Thursday, June 1] before the Historical Commission for the approval of an application from property owner Mindy Jiang to repair the exterior wall of the first and second floors of the building. Jiang did not appear to be present at the property at several points from Tuesday afternoon to late Wednesday morning. Although the top half of the rear wall has been removed, the hearing will take place as scheduled, according to the Planning & Regulatory Services office. The Great Wall is the property’s only tenant. There are four vacant floors above the restaurant. 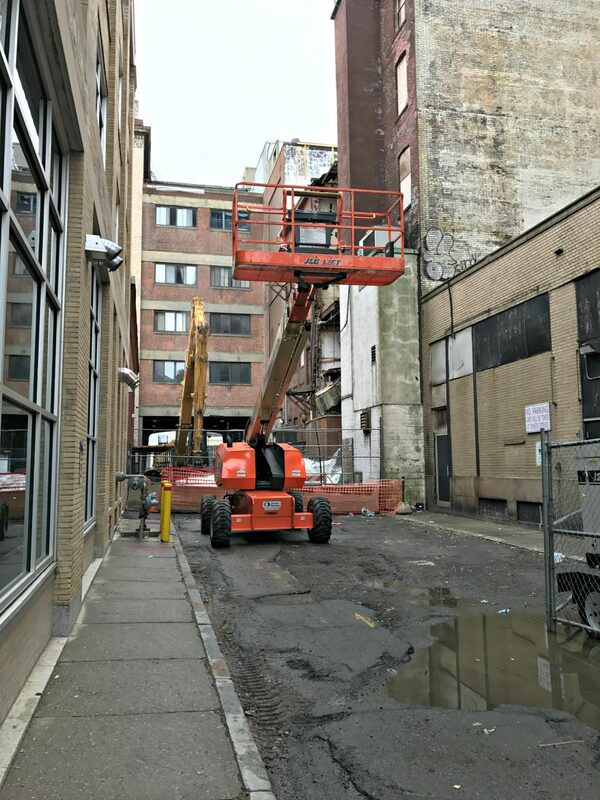 The building is targeted for acquisition and rehabilitation by the city as part of the Worcester Redevelopment Authority’s Urban Revitalization Plan [URP]. Traynor said the recent demolition of the property will not affect the URP’s future plans for the building at this time. “The URP’s plan for 521 Main is that the entire building be renovated, updated and put into active use throughout. What happens to the property in light of the partial structural failure remains to be seen, but the goal of the URP remains the same – to revitalize the area within the urban renewal plan area,” Traynor wrote. The revitalization plan, made public last Spring and approved by the state in September, proposes a mixed-use solution, with retail space on the first floor and residential space to be developed above. Under the plan, a total of 28 “key” properties are scheduled for redevelopment and rehabilitation, including 521 Main St., its neighboring business, MetroPCS, and the residential condominiums at 531 Main St. Check back with Worcester Sun for further updates on this developing story.